To mark down the symbols of words is to express ones imagination, we then wheel our wand of creativity! We are all writers engaging in creating our life’s script as every moment is spelled out. We write on the canvas of our minds using the language of our imagination. 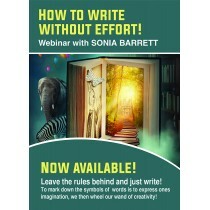 Stepping outside of the rules and beliefs about how to write, will allow you to simply write. Writing is freedom; just as an artist paints the imagined on canvas, while tapping into other worlds. Although we each appear to have a knack for certain abilities, even then repetition sharpens that skill. A writer becomes more confident in the way words are paired together creating just the right flow. Let it out! Let’s see what’s been waiting to burst forth from within your well of creative expression. Or just simply to write!